Getting your emails delivered to the inbox can be challenging. Improve inbox placement by using InboxRoad as your outgoing email server. The InboxRoad mail servers provide a solid foundation to ensure the highest inbox success rate for your email. InboxRoad: Messages that Reach the Inbox. Use of dedicated or shared IPs or even a mix. The InboxRoad email delivery infrastructure can scale to meet your demands as your email volume grows. Based on PowerMTA technology, emails are quickly deployed in a way that maximizes email delivery. A dedicated team constantly monitors SMTP traffic and deliverability. Use the InboxRoad outgoing mailserver for optimal deliverability of your email campaigns. No extra hardware, software or technical knowledge required. We help you get started and set up sending SPF, DKIM. After sending your campaigns you get real-time information about hard and soft bounces and your feedback loops. Are you looking for an InboxRoad alternative for your email marketing? We listed some InboxRoad alternatives. InboxRoad is maintained by the Basegrow professional deliverability team. An email company focused purely on email deliverabilty. Through their managed SMTP service InboxRoad, professional advice and yearlong email deliverability expertise they are able to boost deliverability rates like no other. InboxRoad is the perfect companion to the Ongage Campaign system. 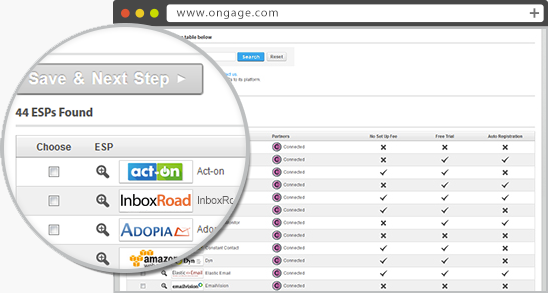 Ongage allows organizations to seamlessly route their emails via multiple mail servers from one front-end and maximize your ROI through Micro-Deliverability. Basegrow is a premium Ongage partner and reseller and can help you find and choosing the best combination of email delivery services. Need your emails to reach the inbox? Try InboxRoad.